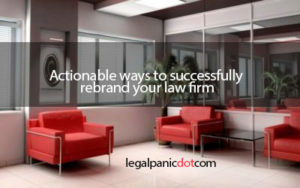 We shall consider three actionable ways to successfully re-brand your law firm. A brand is much more than the word implies. Whereas ‘to brand’ means to attach identification to something – as in branding cattle and such. these days law firm branding is more about getting your audience to understand the overall experience. Think of the major world brands – Coca Cola, for example – and then consider their advertising and marketing approach. They are offering much more than just a drink. It’s all about the ‘brand experience’, and that applies equally to law firms as it does to anyone else. Each area of commerce and industry has its own ideal branding approach; what applies to a law firm will not necessarily be appropriate for, for example, a fizzy drinks company. Yet, the basic premise still applies: getting the right point across to the right people. A Law firm branding must be actionable to enable prospective clients to look forward to an exciting experience and not scared to contact your law firm. Let’s consider three actionable ways to successfully re-brand your law firm to enhance your law firm branding when you intend to re-brand it. Branding needs to be specific to certain aspects of the business if you are to be able to get your point across. Let’s have a look at the three areas of branding that you should consider carefully if your law firm is to benefit to the greatest degree from your re-branding exercise. Where do you stand in the market place? What are you offering, specifically, that the law firm down the road is not offering? This is about defining your position in the legal services market, and in letting the right audience know that is what you are providing. Positioning involves a lot of investigation to understand the market; you need to know, in the first place, who your target audience are. A firm specialising in services for the elderly, for example, need to target a different audience than that offering conveyancing for home-buyers, or other services likely to be taken up by younger clients. Thus, understanding your audience, and making it clear what you offer and what your areas of expertise are will give you a greater position in the market than a rival firm that is simply placed in the middle, and purports to be able to offer all available services. It will enable you to spend your budget more effectively on reaching potential customers who need your services. The brand experience goes far beyond simply getting the service to the client; it needs to be done in a way that the client is entirely satisfied with, and this means making sure the people you have on your team are perfectly suited to deal with the people they will face in their daily routine. This extends not just to the upper levels of the company but starts with those who are the first impression, who answer the phone or who greet visitors. A law firm needs a strict working practice; you need to make sure all your advisors are prone to give the same advice and help. You need to ensure you have employed a team that is trained to be professional. Feedback from poor experiences is far more likely to find its way into a publication or an online forum than that from satisfied clients; this is simply because good customer service is what people expect, and should not be exceptional. To instil your brand with good behavioural routines is to give it a classy image that makes it stand out among the many other law firms. They, too, may also give the same advice and help, but if yours is the firm that is getting positive feedback all the time, yours will be the one that gets the business. Training and education are important, and a carefully constructed recruitment routine will allow you to select the best people for your purpose. One of the most important aspects of law firm branding lies in getting the visual impact of the company just right. This applies not just to the people in your team – who should naturally be smartly dressed, as that is what the public expects from those in the legal world – but also the premises should be neat. Furthermore, it extends far more deeply than that. Consider your approach to advertising, for example, colours, fonts, and the very style of your adverts – both in the press and on screen – are important. The same applies to any literature that you give out or have on hand for visitors to take. The area of law in which you specialise can have a profound effect on the graphics you use, and vice versa. Law firm branding is not just about changing your logo, or even your name, but about giving the entire package an overhaul. You may have an established name, in which case changing it would not be a great idea. Bringing your corporate logo and graphics into the 21st century, however, may be a very good step. There are specialist design companies out there who can help you with this – and other – aspects of re-branding, and they are worth talking to so you can get an idea of what they can offer. Remember to think carefully about how the inside of your premises comes across to visitors, too. The legal industry has a reputation for being traditional – even somewhat stuck in the past – but it does not need to be this way. Visitors will feel far more at home walking into a clean, uncluttered and friendly reception area than they will into an older-type hallway that may feel intimidating, for example. So, if you can bring all these elements together, you will find that a re-branding exercise can be a very successful move. It can also be an expensive one, but if you consult any of the experts in the field, they will happily work with you to make sure that the result is an impressive overall re-think that brings your law firm up to date, and that enhances its standing in the particular area of the market that you are aiming to dominate.